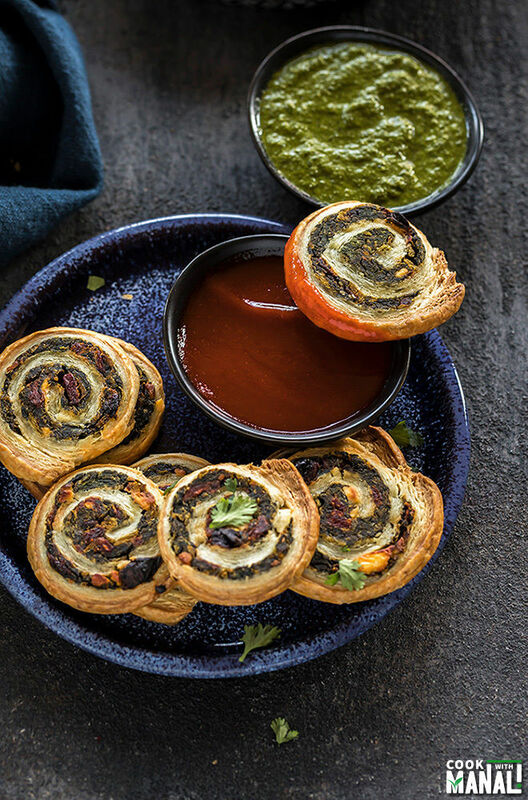 Puff Pastry Pinwheels with spinach, sun-dried tomatoes, pesto and feta! These are super easy to make and make a great vegetarian appetizer for the holidays! Are you guys already done with your Thanksgiving menu planning? 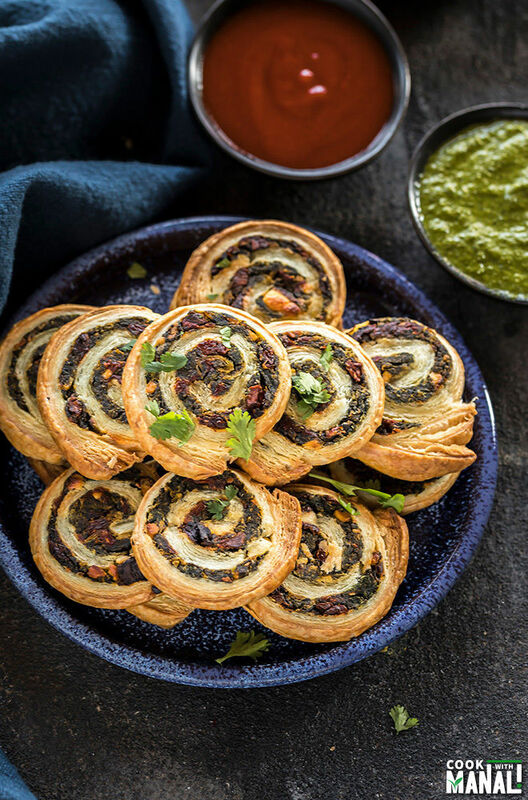 If you are still deciding on an appetizer that you can serve your guests, give these Spinach & Sun Dried Tomato Puff Pastry Pinwheels a try! These are super easy to make and have so much deliciousness going on! My love for puff pastry is known to everyone. I always have few sheets in my freezer because they are so versatile and in case of unexpected guests/visitors, I can always rely on them to whip up something delicious in no time. Whether it’s sweet or savory, I just love using puff pastry in my recipes. 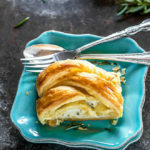 These savory pinwheels are the latest addition to my ever growing puff pastry recipes. 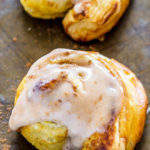 By the way, if you are looking for something sweet on Thanksgiving morning, you can give these Puff Pastry Pumpkin Cinnamon Rolls a try. 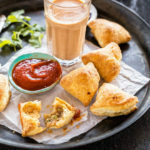 They are great for breakfast on a cold morning and also super easy to make. 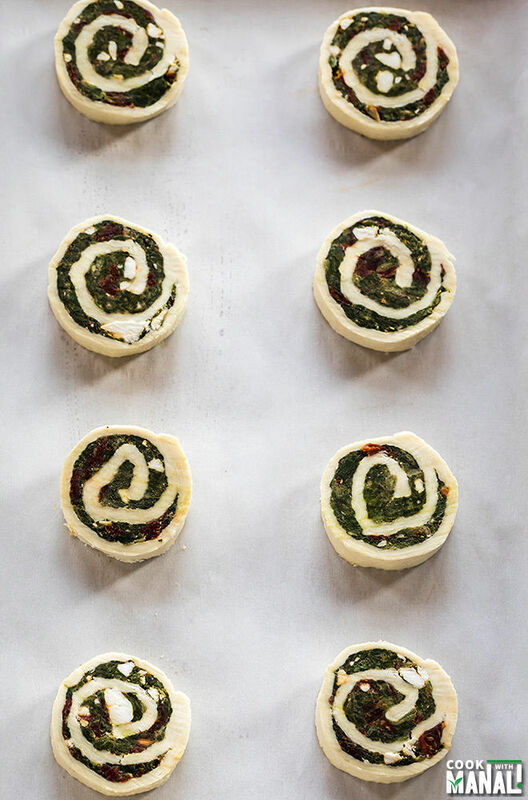 Coming back to these Spinach & Sun Dried Tomato Puff Pastry Pinwheels. 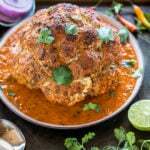 These are so flavorful and require only a handful of ingredients. To cut short the process I used frozen chopped spinach. You can very well use regular spinach and then chop it but I wanted to make these in the minimum amount of time possible so I just bought frozen chopped spinach from the grocery store. Once the spinach is thawed you only have to mix all the ingredients together! Garlic Powder- Because garlic makes everything better! As you guys can see, the ingredients list is small for this recipe and I love such recipes for the holidays. 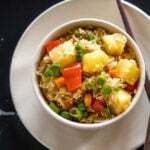 There’s always so much to do during this time of the year, so such easy recipes come in handy. Once you have the filling ready, just fill in the sheets, roll them and then cover them with a cling sheet and freeze. It’s important to freeze them so that it’s easier to cut into pinwheels. Can I make these in advance? You can make these puff pastry pinwheels in advance. You can either make the entire log, cling and freeze or you can just make the filling in advance and keep it refrigerated. Any which way, doing prep work in advance will save you time on busy days! I used 2 puff pastry sheets here and got 48 pinwheels. You may get more or less depending on how thick you cut the pinwheels. 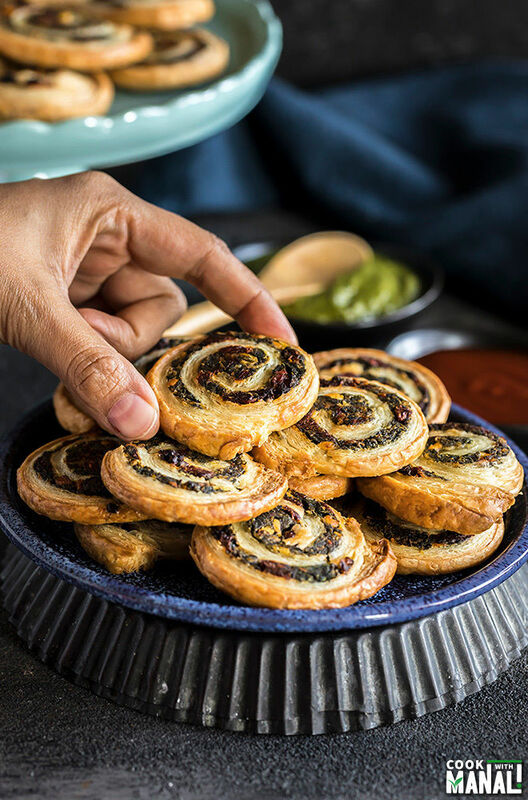 Serve these spinach & sun-dried tomato puff pastry pinwheels with your favorite dips – chutney, hot sauce, ketchup, whatever you fancy! 1- Thaw the frozen spinach according to instructions on the package. Then squeeze as much water as you can from the spinach. Press the spinach between two paper towels to dry and then transfer to a bowl. 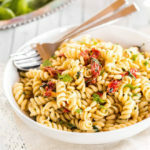 Also add chopped sun-dried tomatoes to it. 2- Add pesto, crumbled feta cheese, garlic powder, smoked paprika, salt and black pepper. 3- Mix until everything is well combined. Divide the mixture equally in 2 parts. 4- Unroll the thawed puff pastry sheets. Roll them slightly to even out the sides using a roller. 5- Fill the puff pastry sheets with the prepared mixture leaving an inch border on all sides. 6- Start rolling the filled puff pastry sheet like a jelly roll. 7- To seal, apply a paste made of flour and water (1 tablespoon flour mixed with 2 tablespoons water) all along and then seal. Repeat with the other sheet. 8- Wrap both logs with cling sheet and freeze for 30 to 60 minutes. Meanwhile pre-heat the oven to 400 F degrees. Once chilled, cut the logs into 1/4 -inch pinwheels. I was able to get 48 pinwheels from the two puff pastry logs. Bake at 400 F degrees for 20 minutes or until golden brown. You may brush them with egg wash before baking for that extra sheen (I did not do it). 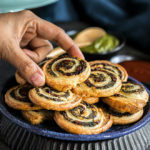 Serve these spinach and sun-dried tomato puff pastry pinwheels with ketchup, mayonnaise or chutney! 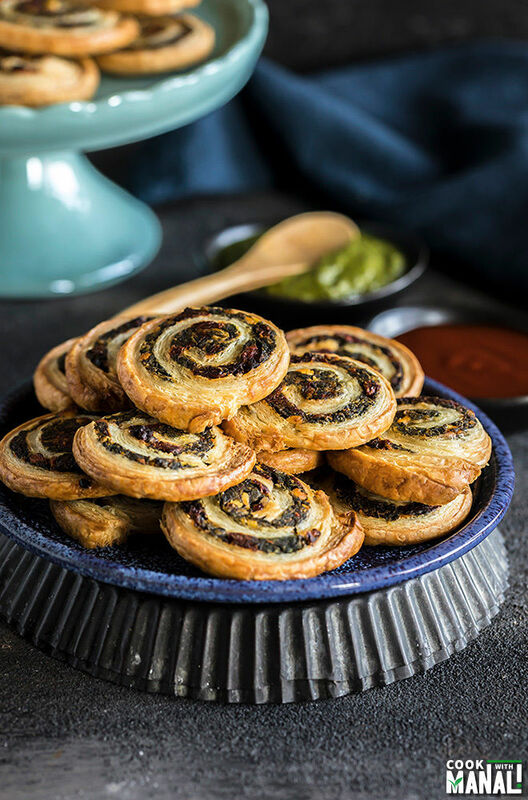 If you’ve tried this Spinach & Sun-Dried Tomato Puff Pastry Pinwheels Recipe then don’t forget to rate the recipe! You can also follow me on Facebook, Instagram to see what’s latest in my kitchen! 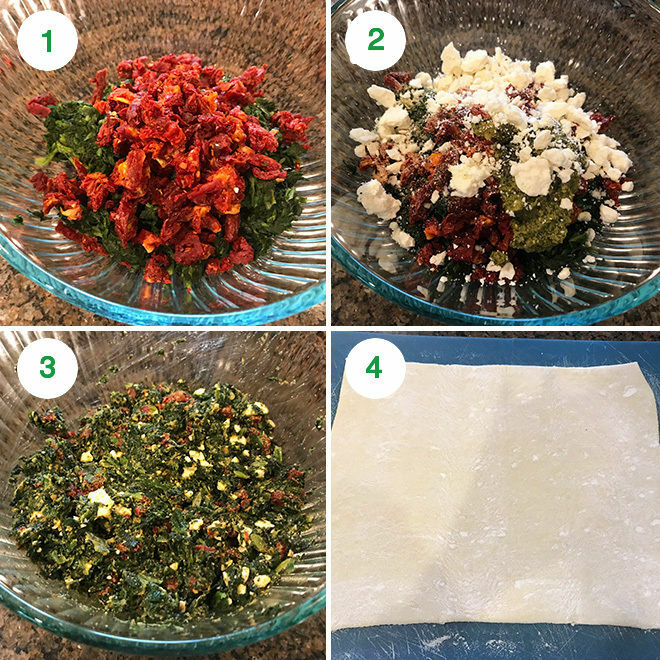 Puff Pastry Pinwheels with spinach, sun-dried tomatoes, pesto and feta! 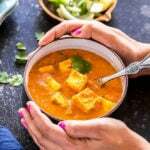 These are super easy to make and perfect to feed a crowd! You can also make these in advance, making them ideal for the holidays! Thaw the frozen spinach according to instructions on the package. Then squeeze as much water as you can from the spinach. Press the spinach between two paper towels to dry and then transfer to a bowl. Also add chopped sun-dried tomatoes to it. Add pesto, crumbled feta cheese, garlic powder, smoked paprika, salt and black pepper. Mix until everything is well combined. Divide the mixture equally in 2 parts. Unroll the thawed puff pastry sheets. Roll them slightly to even out the sides using a roller. Fill the puff pastry sheets with the prepared mixture leaving an inch border on all sides. 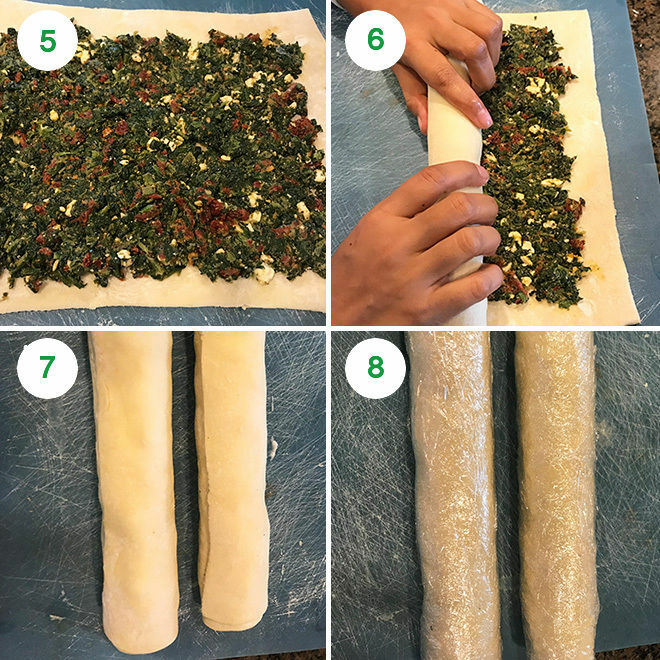 Start rolling the filled puff pastry sheet like a jelly roll. 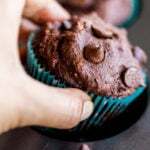 To seal, apply a paste made of flour and water (1 tablespoon flour mixed with 2 tablespoons water) all along and then seal. Repeat with the other sheet. Wrap both logs with cling sheet and freeze for 30 to 60 minutes. Meanwhile pre-heat the oven to 400 F degrees. Bake the pinwheels at 400 F degrees for 20 minutes or until golden brown. You may brush them with egg wash before baking for that extra sheen (I did not do it). Adjust feta cheese and pesto to taste.